Anime Review by Teri O. My Neighbor Totoro (Tonari no Totoro) is an award-winning Japanese animated fantasy film, written and directed by Hayao Miyazaki and produced by Studio Ghibli. Originally released in 1988, this film helped bring Japanese animation into the global spotlight and set its writer-director Hayao Miyazaki on the road to success. It tells the story of two young girls and their interactions with friendly forest spirits in rural postwar Japan. My Neighbor Totoro was re-released by Walt Disney Pictures on March 7, 2006. In the story, 10-year-old Satsuki and her 4-year-old sister Mei, the daughters of a professor, move with their father to an old house in the country so they will be closer to their hospitalized mother. (It’s implied, yet never actually stated in the film, that she has tuberculosis.) Satsuki and Mei soon discover that the nearby forest is inhabited by magical creatures. These creatures get the name “Totoro” when Mei, the little girl who first sees them, mispronounces the word “troll” (“to-ro-ru” in Japanese). The girls have several enchanting adventures as they are befriended and protected by the Totoros. The film’s central Totoro character, a giant forest spirit who resembles an enormous rabbit-owl hybrid, is as famous among Japanese children as Winnie-the-Pooh is among British and American children. This Totoro, the “keeper of the forest” who lives in a huge camphor tree, makes the trees grow; and when he flies over the countryside or roars in his thunderous voice, the winds blow. In the English version of My Neighbor Totoro, the two girl characters are voiced by then-homeschooled sisters Dakota and Elle Fanning. Dakota (b. 1994) was schooled at home and on sets by her tutor until she started high school in her freshman year. Elle (b. 1998) was homeschooled by her grandmother until 2007. Disney did a good job casting these two real-life sisters to play the two sisters in the movie. 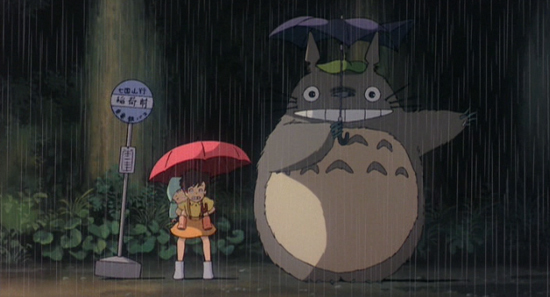 My Neighbor Totoro is one of those rare family films that appeals to people of all ages. It brings out the child in all of us because the story is so remarkably simple, whimsical, and fun to watch. The Catbus, an imaginative multilegged creature with a Cheshire Cat grin, brings to mind Alice in Wonderland. My personal favorites are the cute soot spirits that look like little round dust bunnies and live in vacant houses.